You will make a bewitching sight when you show up dressed in a gorgeous outfit draped by the Black and Red Velvet Hooded Cape. This gothic cape features a striking look with its black velvet exterior and red satin lining. 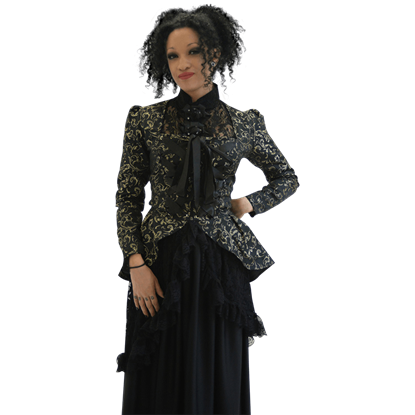 The perfect cover up for dressy evenings out to dinner or the opera, the Black Brocade Bolero Jacket looks great with gothic and Victorian styles. This short black jacket ends around the midriff in the back and has long sleeves. You will look like a mysterious shadow in the night as you stroll beneath the full moon in this dramatic black cape! 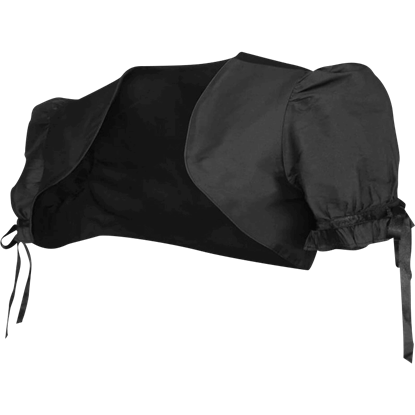 The Black Velvet Hooded Cape makes an excellent finishing touch to any of your fancy dress ensembles. An elegant cover-up when heading out for an evening at the opera or a cocktail party, the Catherine Black Lace Cape drapes from your shoulders to down past the hips in the back. The sheer lace cape displays a lovely floral pattern. Stand out from all your friends and family when you wear this eye-catching gothic accessory! 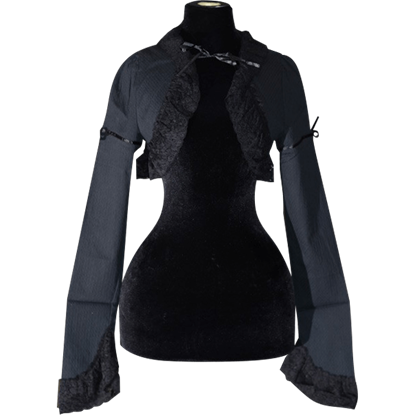 The Gothic Bell Sleeve Shrug features a collar that extends over the shoulders and arms, ending in flowing bell sleeves. Enjoy the open style of this black bolero jacket with just about any piece in your wardrobe. 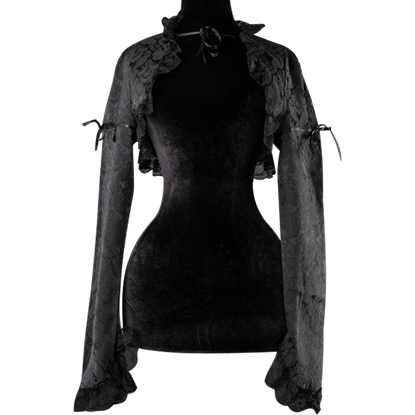 The Gothic Black Lace Bolero Jacket cuts off high on the back and ties loosely at the front, making it a great light jacket for cooler nights. 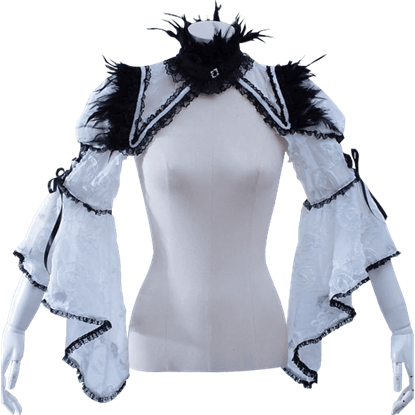 When you need a light jacket for gothic attire, this cropped bolero makes a fantastic choice. 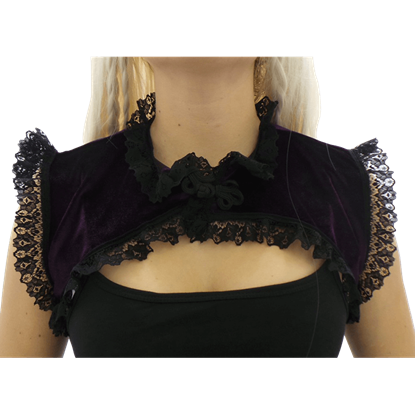 The Gothic Brocade Cropped Bolero Jacket works well as a cover up for formal outfits and many styles of gothic clothing. Crop jackets offer an excellent option for light outerwear when the weather begins to turn slightly cool. 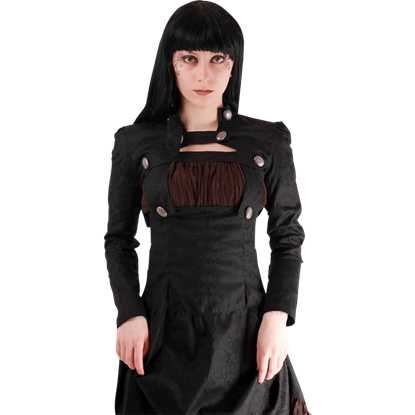 The Gothic Crown Button Crop Jacket makes a fantastic cover up for formal attire and looks fabulous with gothic styles.